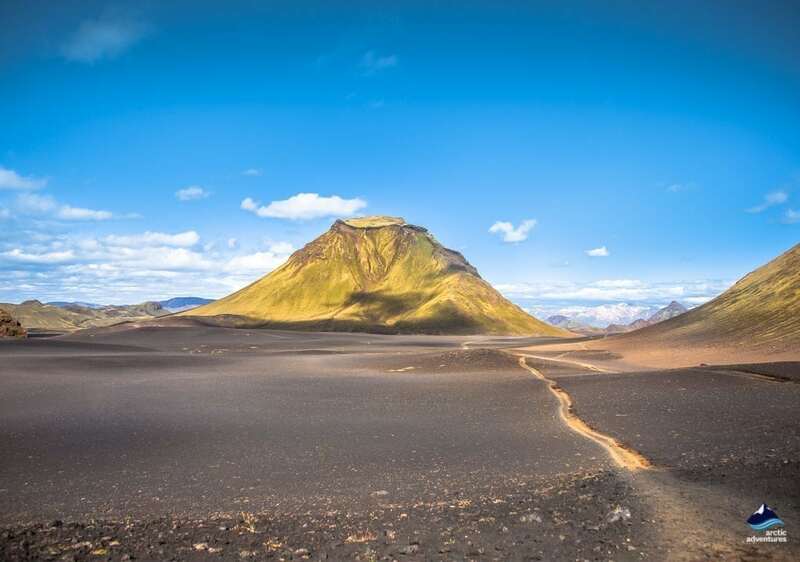 The Laugavegur trek, the most famous and popular trekking trail in Iceland, is now listed by National Geographic as one of the top hiking trails in the world. 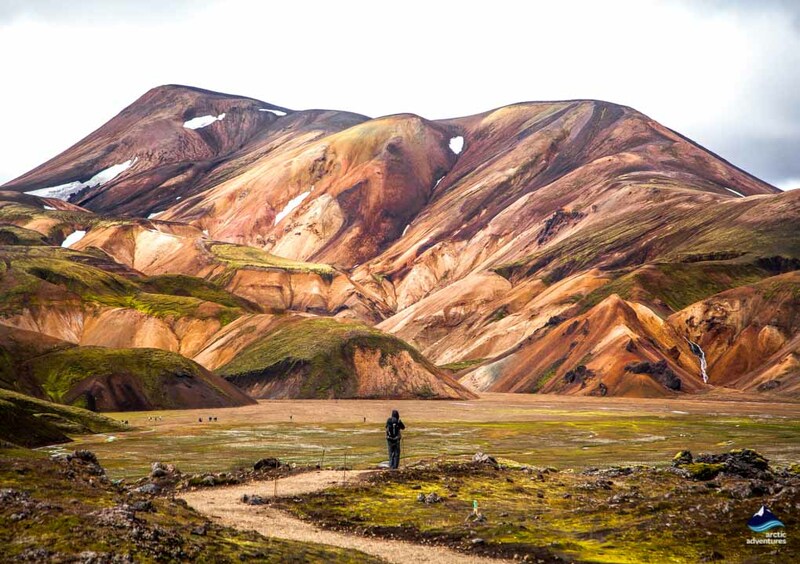 Hiking from the geothermal paradise of Landmannalaugar, crossing black sand deserts as glaciers tower high above you, to the green valley of Þórsmörk (Thorsmork) will leave the whole family with incredible memories. 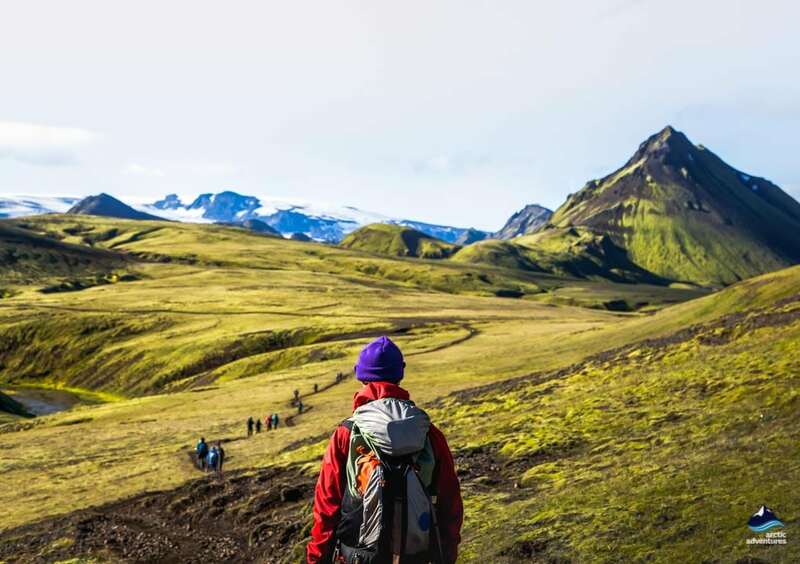 Enjoy the ultimate trekking in Iceland experience together with your family on a four day guided tour from Landmannalaugar to Þórsmörk on the world renowned Laugavegur trail, listed as a world top 20 trail by National Geographic. 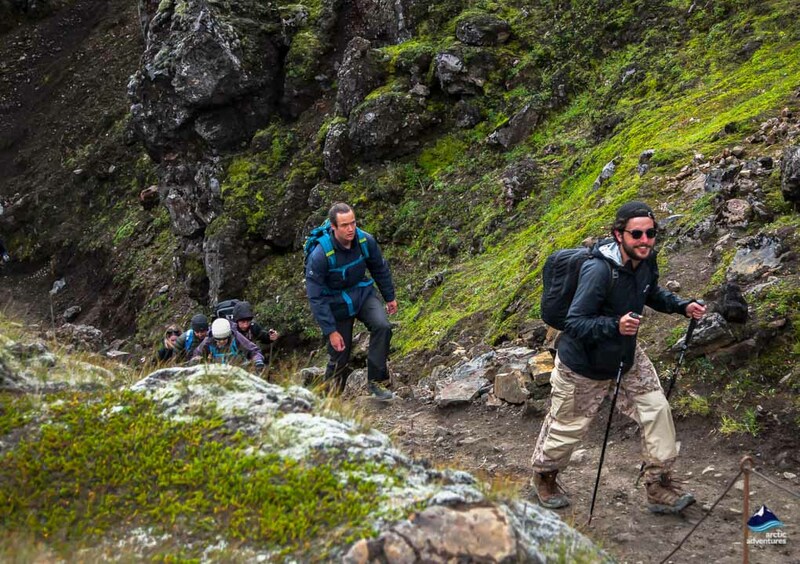 This tour provides an absolutely ultimate Iceland trekking experience for the whole family. Each one of you will take home a backpack filled with precious memories and incredible highlights! 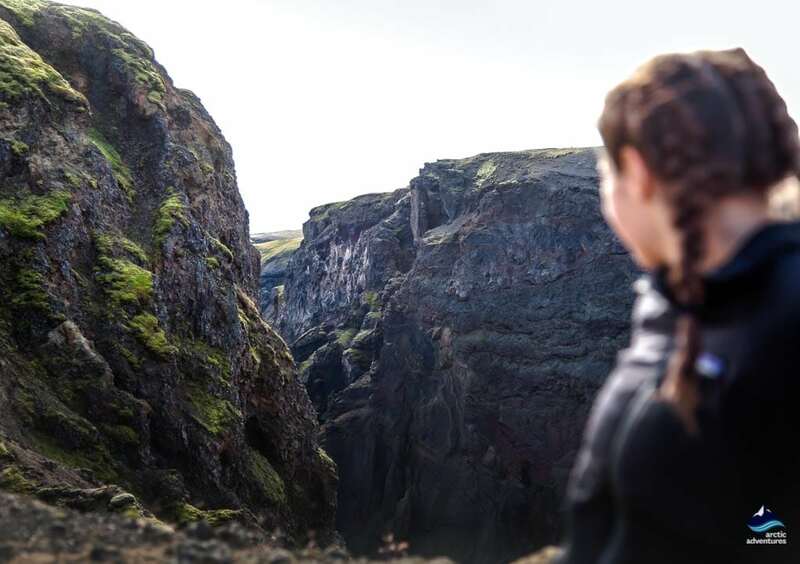 You will hike through magical geothermal areas, impossibly colorful rhyolite mountains, and great canyons with famous volcano mountains and glistening glaciers decorating the horizon. 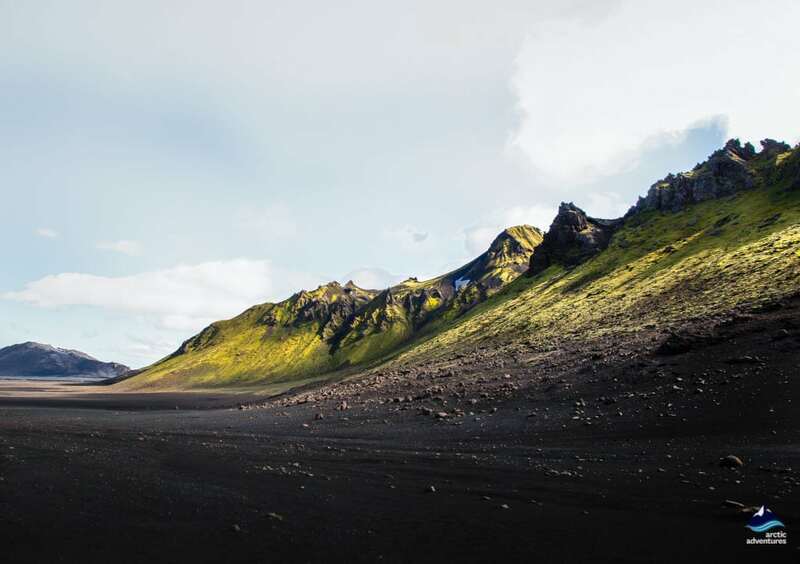 Your footsteps will take you ever further away from the buzz of the city as you step into the complete serenity of the amazingly peaceful Icelandic nature, mesmerizing scene after mesmerizing scene will open out before your eyes. The best part of all? 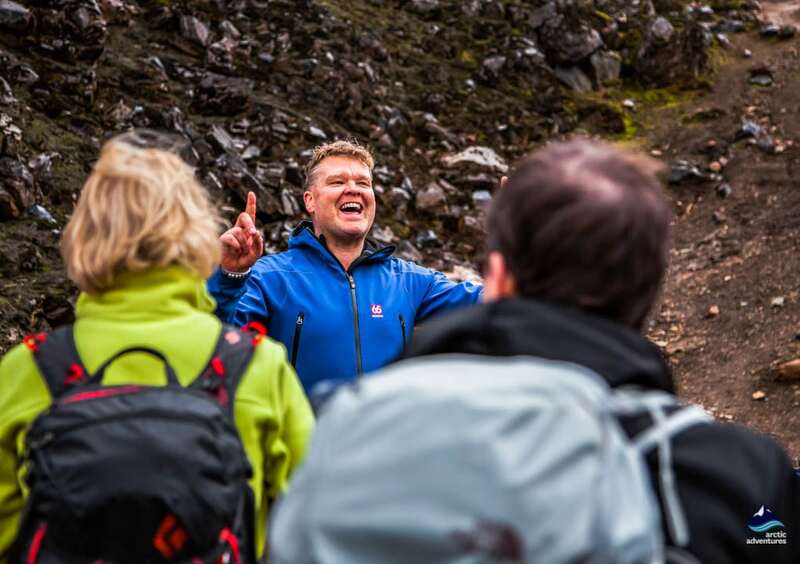 You get to explore the very best of Icelandic nature with your family and to make friends with hiking families from around the globe. This four-day family trekking tour is a supported trek so your main luggage will be transported between camping places. You just need to carry a day bag. Particularly mindful of the younger children in the party a sturdy 4 x 4 Jeep is used to cross the larger rivers. Your professional guide organizes everything and prepares the meals but assistance from participants is warmly appreciated – enjoy being part of the friendly team! 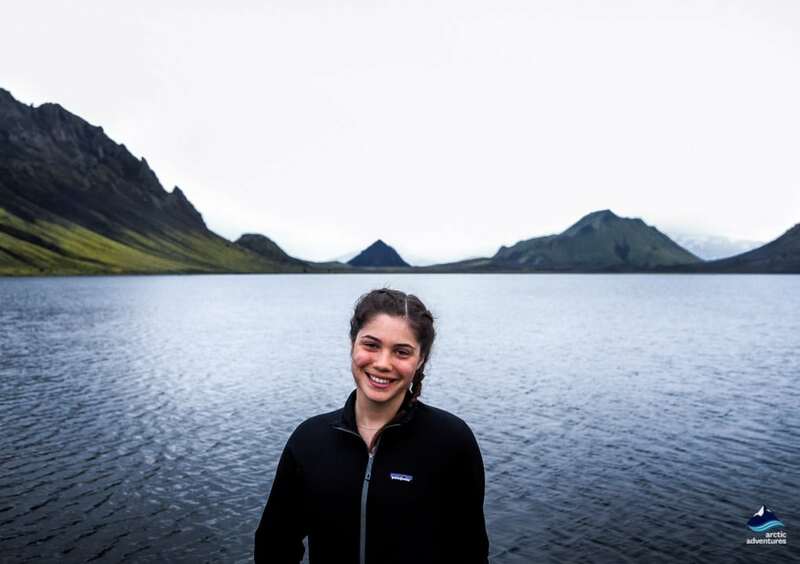 After introductions, we board the scheduled bus which will take us to Landmannalaugar, where you will begin hiking the Laugavegur trail. 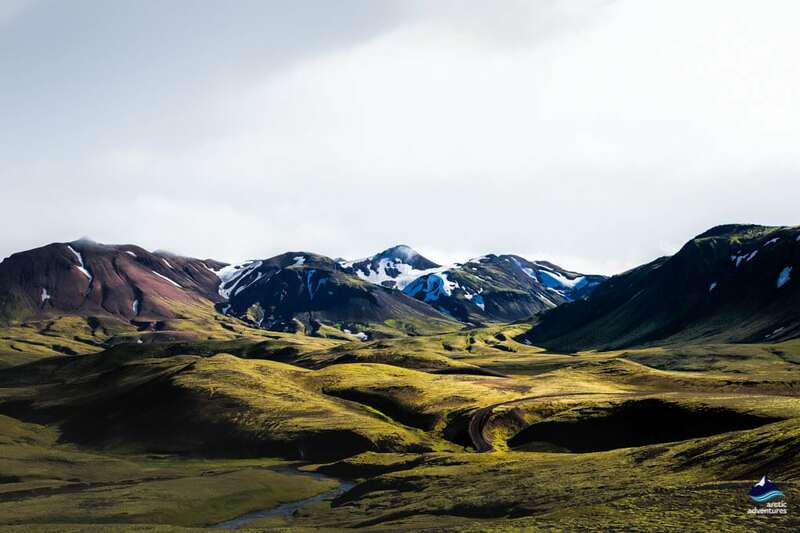 The drive from Reykjavik takes about 3-4 hours, we travel along the scenic south coast before turning inland and passing close to Iceland’s most active volcano, the notorious Hekla. 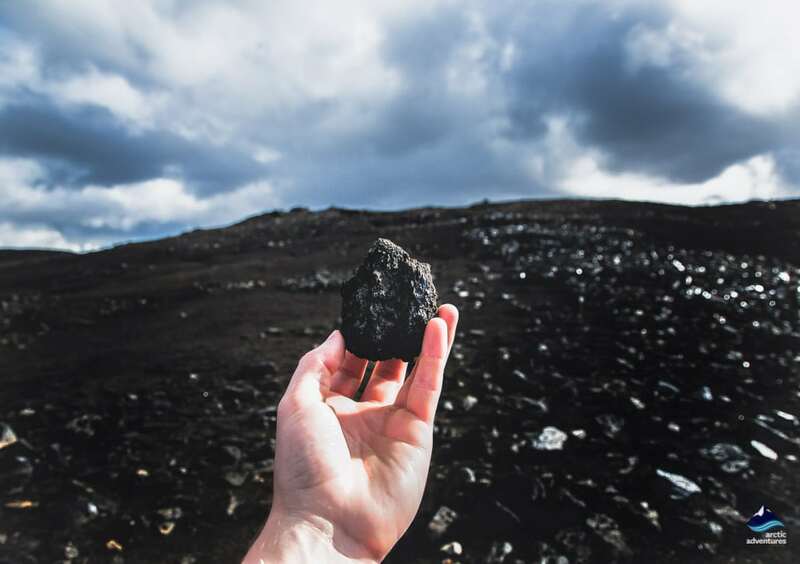 The road will get rougher and the rugged and raw Icelandic nature will be all around us. 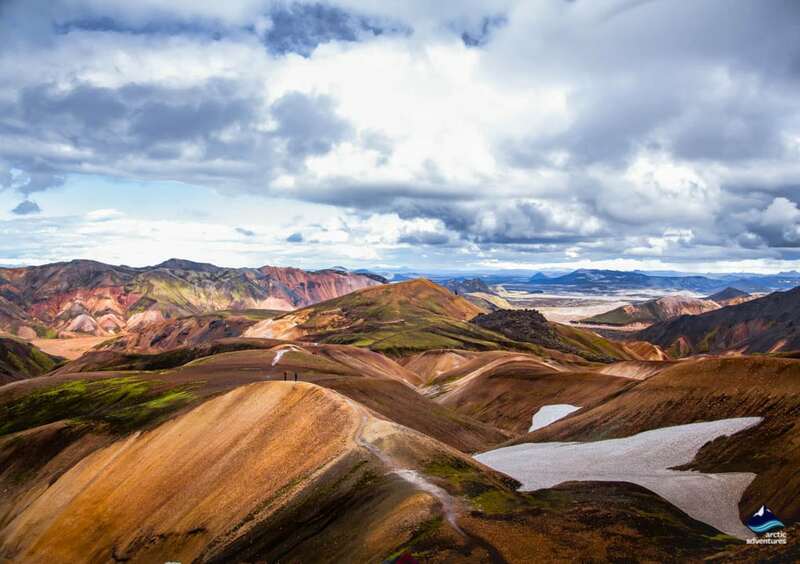 Your hike begins in Landmannalaugar as we walk through this geothermal wonderland, dominated by vibrantly colorful rhyolite and soft sand-toned mountain peaks, you will see steaming hot springs. We will visit a very beautiful hot spring, Stórihver (Large Spring), before the trail takes us into the obsidian desert by Hrafntinnusker. 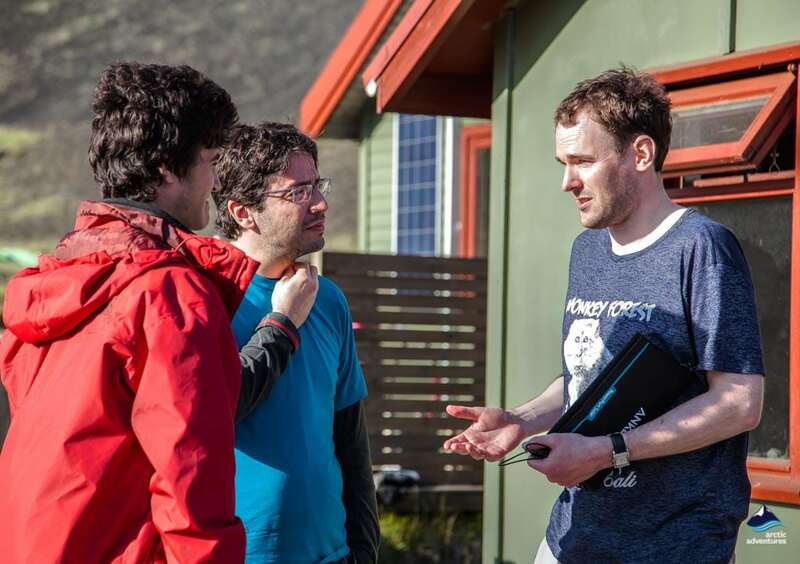 We set up our first camp at Hrafntinnusker, one of the most remote camping grounds in Iceland. We enjoy a delicious supper in our kitchen tent, getting to know one another better in the midst of the most magnificent Icelandic nature. Distance: 12 km (7.5 mi) Walking time: 4-5 hrs Ascent: 470 m (1540 ft). 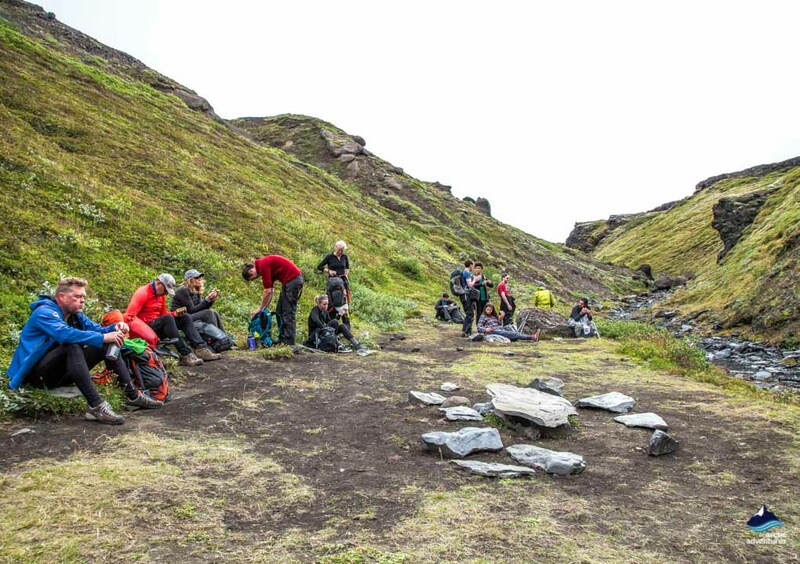 We get together over a nourishing breakfast in our kitchen tent before we set off to trek Iceland once again! Today the trail will take us along the Reykjafjöll Mountains before we drop down into the Jökultungur area. We will see how the geothermal activity has transformed these gullies into yellow and red natural masterpieces. From the top of Jökultungur, there are magnificent views over the whole Fjallabak area and the lake, Álftavatn (Swan Lake) which is where we will make our next overnight camp. To reach Álftavatn we will need to cross an unbridged stream on foot, exciting and refreshing for the feet. The campsite is in an idyllic location next to a small stream at the side of the lake. Distance: 12 km (7.5 mi) Walking time: 4-5 hrs Descent: 490 m (1610 ft). After breakfast your day will begin with another refreshing stream crossing then we make our way past the unusual green volcano, Stórasúla (meaning Large Column) and into the black sand desert of Mælifellssandur. Along the way we will get a great view of Hattafell, an unusual flat-topped volcano. 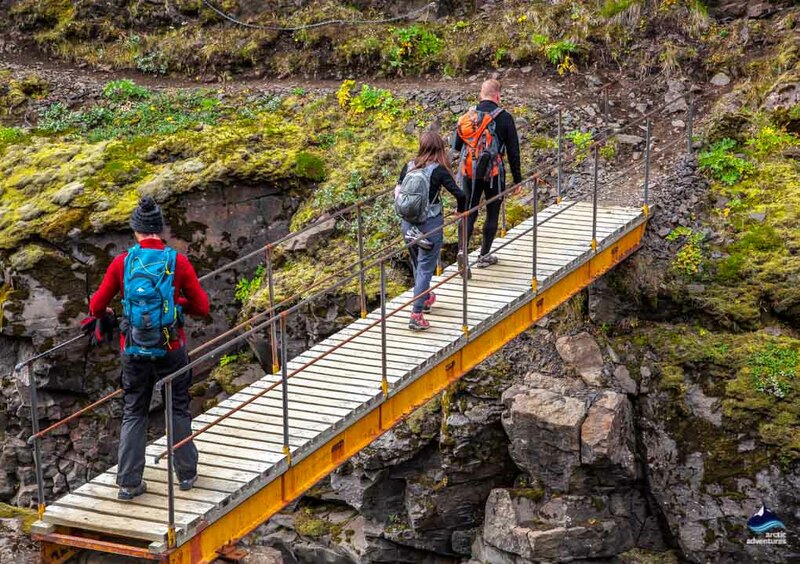 The trail continues over the black glacial desert and into Emstrur, on a day with good visibility there is a chance to enjoy spectacular views of the mountain glaciers, Eyjafjallajökull and Mýrdalsjökull, each one houses a well-known volcano beneath its ice cap! The magnificent mountain pass at Fimmvörðuháls sits between them. Just before the campsite, we deviate a little from the path, taking a look at Markarfljótsgljúfur, an almost 200m deep canyon which has been carved out by the glacial river, Markarfljót. 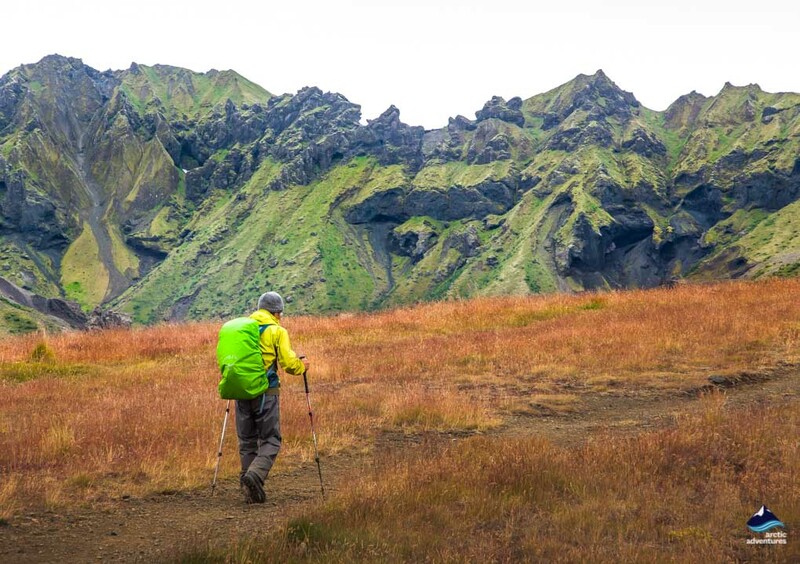 Trekking Iceland at its most glorious! The campsite in an attractive vegetated area is a very welcome sight after the long walk, a soft green oasis magically appearing in the black sand desert. It is here that we will make camp and spend the night. Distance: 15 km (9.5 mi) Walking time: 6-7 hrs Descent: 40 m (130 ft). We leave Emstrur behind and continue on our way alongside fabulous canyons to Þórsmörk (Thorsmork). 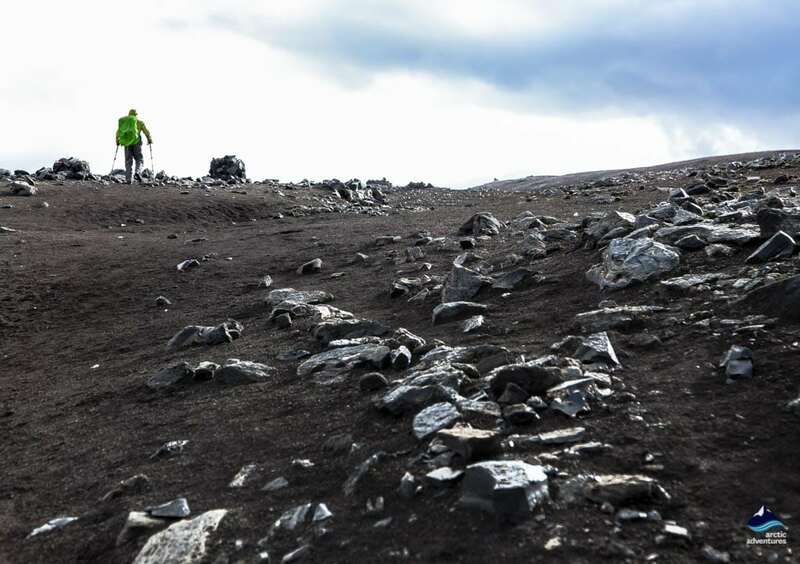 The trail will take us within a few kilometers of the great Mýrdalsjokull glacier. As we descend towards the Almenningar (gorge) a few trees can be seen, a sure sign we are getting closer to the birch forests of Þórsmörk. Our hike will take us to the foot of Mount Einhyrningur (Unicorn Mountains), and yes, its shape really does resemble the creature of myth and legend! We enter the valley of Þórsmörk, a fertile green valley situated between the rivers Krossá, Þrongá and Markarfljot, there are magnificent views of the Mýrdalsjokull and Eyjafjallajokull volcano mountain glaciers. Distance: 15 km (9.5 mi) Walking time: 6-7 hrs. Descent: 300 m (985 ‘) Driving time: 3-3,5 hrs.